“Exercise walks away with the award in the role of best supporting player in transition to a plant-based diet” – from The Plant-Based Journey. When five-term mayor of Marshall, Texas, Ed Smith, received a diagnosis of prostate cancer in 2008, he decided to treat it with aggressive dietary changes under a doctor’s supervision. Mayor Smith began eating only whole grains, vegetables and legume, nuts, and fruits. Later scans showed that the cancerous growth had disappeared. Before you know it, Ed and his wife, Amanda,founded the Get Health Marshall non-profit organization. Get Healthy Marshall also has monthly free potlucks, conducts free grocery tours, and hosts other events – though Healthfest is the largest event sponsored by Get Healthy Marshall. Which seems as good a place to start as any. Here are five reasons to get yourself to Get Healthy Marshall next year – officially slated to begin April 1, 2016. 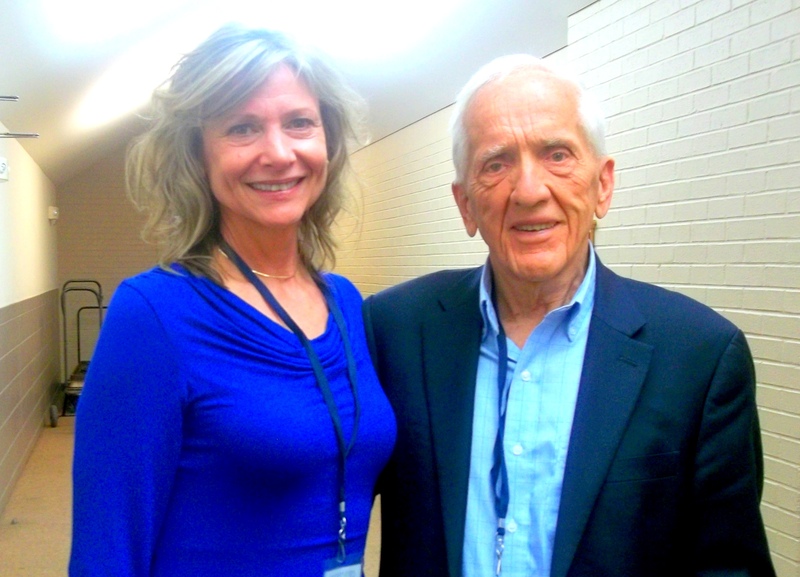 When an event launches with the likes of Dr. T. Colin Campbell, you know you’re up to something good. Rich Roll warmed up the crowd with his story of plant-based transformation, but the seats filled even more when Dr. Campbell took the stage. Cutting right to the core of The China Study, this set the tone for the event. This was also my first opportunity to thank Dr. Campbell personally for coauthoring the Preface to The Plant-Based Journey – the moment captured on camera at right. I can’t wait to get the Preface into your hands! It stands alone as a poignant lesson on plant-based living. Dr. Garth Davis and I never seem to run out of things to talk about. I hope that soon you get a chance to hear Dr. Garth Davis present. With one of the best ‘protein’ rants around, Garth even has a book coming out around the same time as Journey titled, appropriately, Proteinaholic. Don’t you love that? Garth is able to blast the protein myth to the ground (the misdirection that we need lots of protein) with lightening speed and entertaining flair. 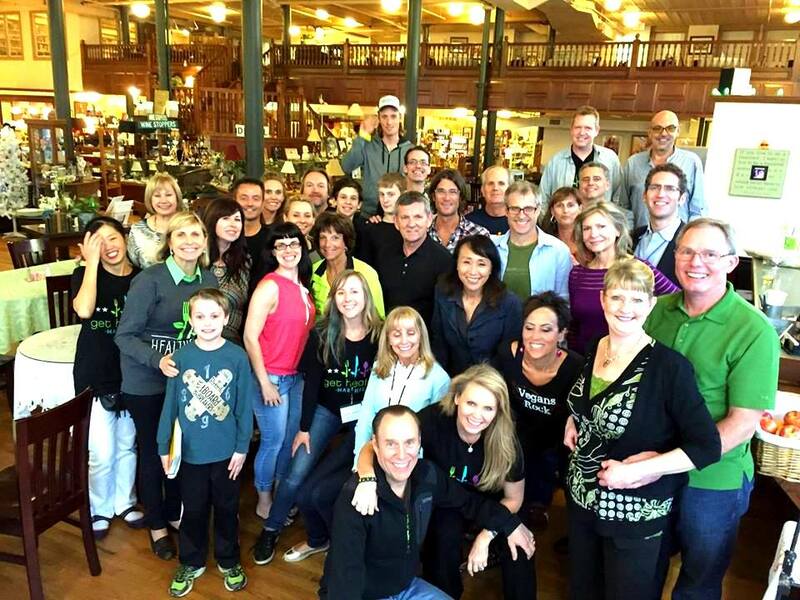 I first met Garth last summer when we shared the stage at the PCRM Intl. Diabetes Conference in D.C. Put Proteinaholic on your Amazon wish list. 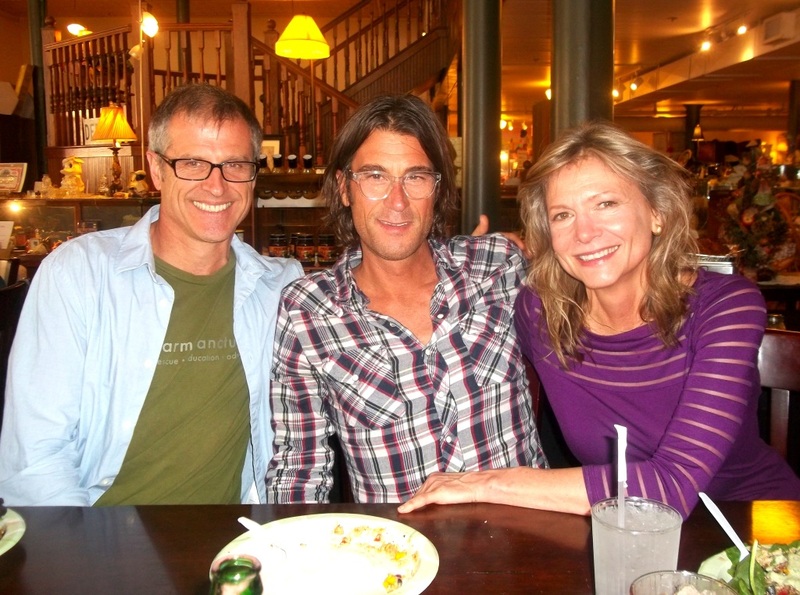 Breaking bread with Gene Baur and Rich Roll? No complaints here! Gene Baur, of course, is one of my favorite people anywhere, any time. A tireless advocate for the animals and all things plant-based, and co-founder and president of Farm Sanctuary, I bumped into Gene early Sunday at Marshall’s Central Perk, which had flooded their entire menu with vegan options. My publisher was taking me out for lunch via two of my darling partners in The Plant-Based Journey book adventure: Heather my editor, and Lindsay, the marketing genius. As we were about to sit down to eat (I had a Reuben sandwich, which I enjoyed so much I’ve recreated it twice since getting home from Healthfest, see picture below), Gene Baur walked in. Which gave us a chance to catch up. 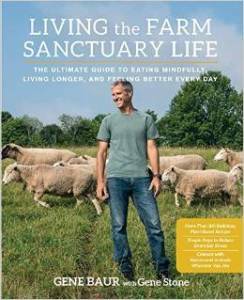 Gene has a new book coming out – Living the Farm Sanctuary Life – due for release this Tuesday, April 7. I’ve had a chance to get an early sneak preview of this book and am thrilled to see that it fires on all of the cylinders I hold dear about plant-based living: the health, the animals, and the environment. It’s a gorgeous, wonderful work and when you pre-order by April 7, you can enter your name into a raffle here to win all kinds of prizes. By the way, Gene is scheduled to be on Jon Stewart’s The Daily Show on Monday, April 6! See you there. The speakers list didn’t stop there. Miyoko Schinner (Of Miyoko’s Kitchen and Artisan Vegan Cheese fame); Cardiologist Dr. Robert Osfeld (MD Yale and masters, medical and cardiac training, Harvard). He has won multiple teaching awards, speaks nationally about cardiac health and passionately spoke about the benefits of a whole food plant-based diet. 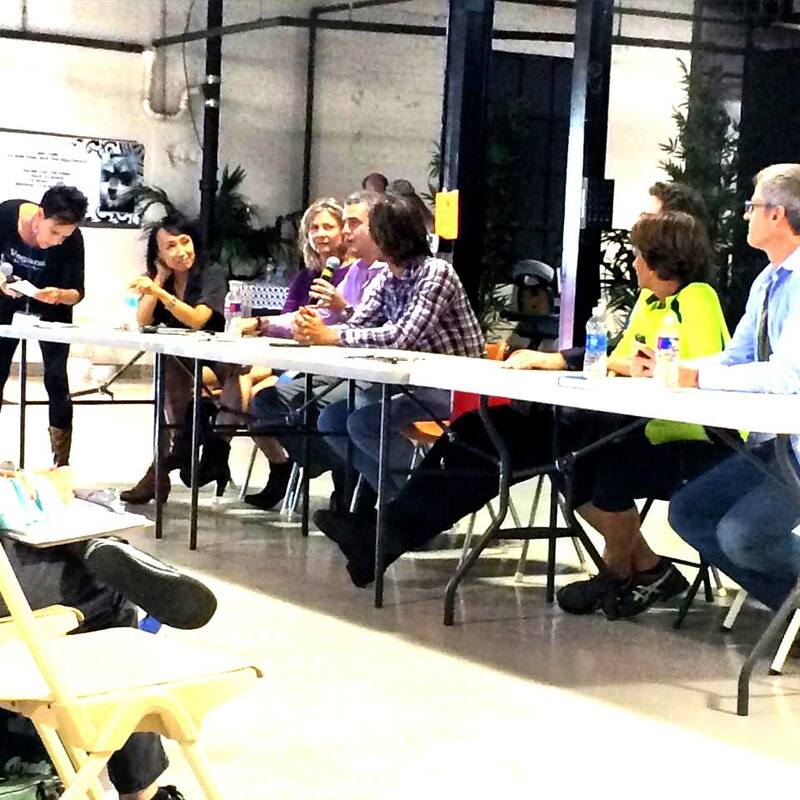 The Speaker’s Panel was the last event at Healthfest. Left to right: Chef Aj, Miyoko Schinner, yours truly, Garth Davis, Rich Roll, Robert Ostfeld, Ellen Jaffe Jones, and Gene Baur. Chef Aj, Del Stroufe, Ellen Jaffe Jones, Matt Frazier – the No-Meat Athlete – and an otherwise all-star speaker’s fleet filled the days with extraordinary presentations. All-in-all, three physicians presented, including the medical director of Cook County (Chicago), including urologist Dr. Terry Mason, who apparently held everyone’s undivided attention with his “It Has Nothing To Do With The P____” talk. Mason expounded about how all blood vessels are connected. Block one, and you block the others. The doctors concur that diseases can in large part be stopped cold, reversed and even prevented by a whole foods plant-based diet. The Reuben Sandwich I ate at Central Perk in Marshall was so good that I came home and recreated it (above) in my kitchen. 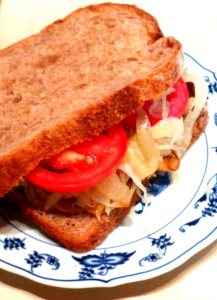 Sourdough wholegrain bread, carmelized onions, sauerkraut, sliced tomatoes, and toasted tofurky. My contribution came in four parts. 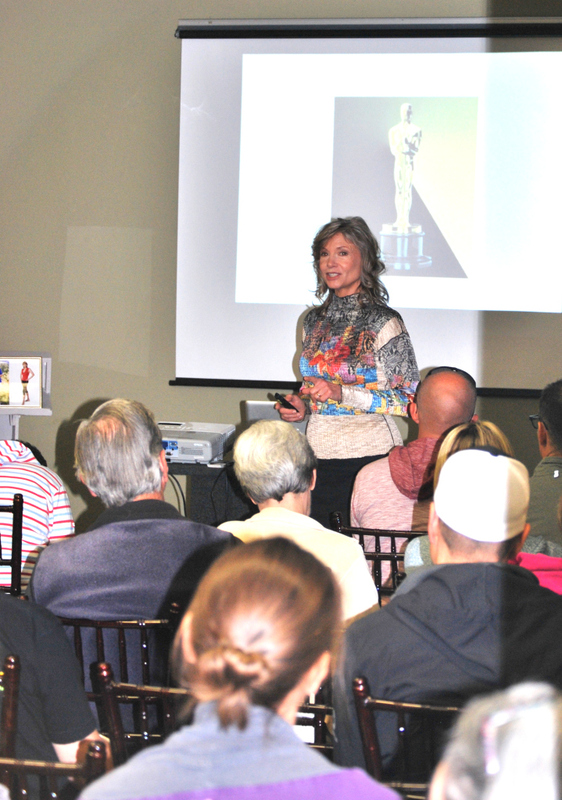 First, one of my favorite presentations to deliver, “The Food and Fitness Connections: the Profoundly Powerful Effect of Exercise on Your Plant-Based Journey” – because of the changes physical activity make in your brain. Lifestyle change demands neuron power that nothing can fire up quite like a little bit of exercise. With Miyoko, Chef Aj, and Del Stroufe in the lineup, just as you suspected we had plenty of opportunities to indulge in all kinds of abso-delicious plant fare throughout the weekend. Several food demos delivered non-dairy mac and cheese, some of the best potato salad I’ve ever had, black bean chili, and did someone say veg lox and bagels? I have the recipe to prove it. And best of all, I found out how to sneak into the backstage kitchen and “taste” (I don’t use little plates) the preps and leftovers. Stick with me! Not only that, but the entire fleet of restaurants in downtown Marshall had ballooned the plant-based menu section of their menus to include an astonishing variety of plant-based plates. Veggie burger with raspberry chipotle sauce? Reuben sandwich? Mac and non-dairy cheese? Portobello burgers? Salads of all kinds? Let’s just say it was easy to get eats. Three, 20 minute Fit Quickies exercise sessions were peppered in throughout the course of the weekend. I never had time to shift out of my “presenting” threads – skirt and the cute heeled boots that I brought along for the occasion. But that didn’t matter at all. As a matter of fact, I kind of liked that it turned out that way because it sent the message that you can sneak physical activity in anywhere, any time – even if you are still in skirt and heels. 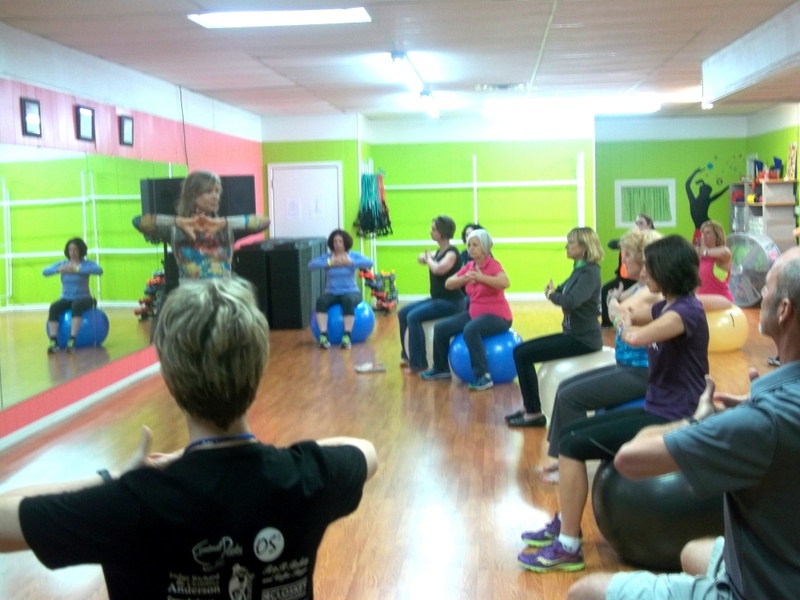 Big thanks to everyone who came out for my sessions at the beautiful Shake and Move Fitness. And blow me down if I didn’t place first in my division on the Sunday morning 5K Fun Run. Honestly, though I jog (ramble? joggle? walk-burst?) every morning in the woods at home, I haven’t run a race in years. 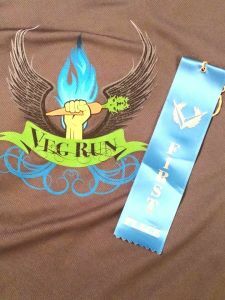 Must have been the PCRM VegRun t-shirt I was wearing. Do I really now get to say that I “placed” in a race in which UltraMan Rich Roll was entered too? I’ll take it! Marshall, Texas is a small town. So small that if the cafe owners are in the mood for closing for a day, they just do. And many of them do just that on the weekends. But for Healthfest weekend, Marshall rolled out the red carpet. As mentioned, all of the restaurants beefed up the plant-based options on their menus and stayed open extra hours so we could eat whenever the mood hit. And lucky, lucky me was the house guest of Christina and Judge Richard Anderson. 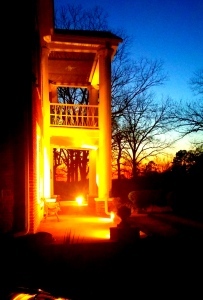 They have restored an old plantation home built in 1845, that sits on 400 acres of woods and grasslands. Christina and Richard vacated their main house and moved themselves to an adjoining guest house, leaving my dear friend and travel buddy Miyoko Schinner and myself the run of the mansion. Miyoko and I were there for four nights, so this was no small feat. 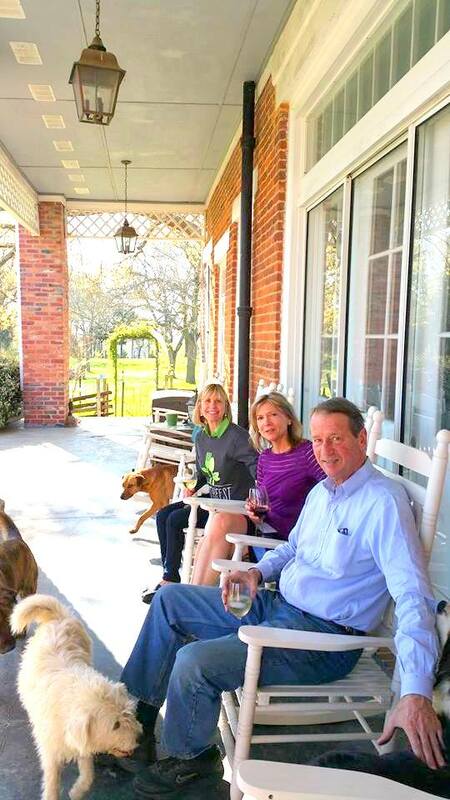 Talk about southern hospitality! The speaking venues were all perfect and in high polish for the occasion. 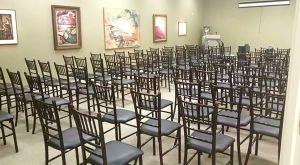 I lucked out and presented in the beautiful art gallery at the Michelson Museum. Perfect ambiance. 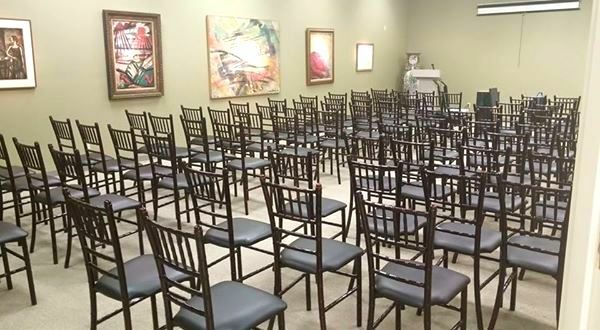 The gallery in Michelson Museum was my presenting venue – all the chairs and artwork ready for attendees! The speakers, the fitness, the food, and the town-every bit of it part of the fun. One of the nice things about Marshall being so quiet is that parking was easy and the entire historic downtown area was like our own private conference center. We’d easily amble the streets between the food demo hall and the Museum, where I had the great good fortune of presenting in a beautiful art gallery. Saturday evening was a wine and cheese party with the serving of Miyoko’s Artisan Cheese. Expecting 50 – 75, over 300 turned out for this event. Hope to see you next year in Marshall! After over a year of working together on The Plant-Based Journey, I finally got to meet Heather (l) , my editor, and Lindsay – from my publisher, BenBella books. Talk about publisher support! 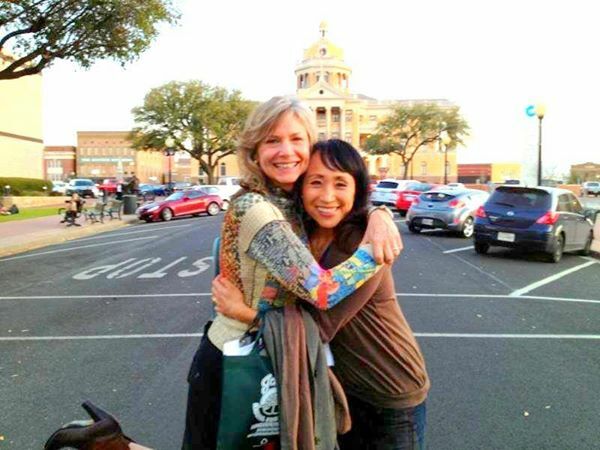 Me and my friend and travel buddy Miyoko Schinner mixing things up in downtown Marshall. If you look closely you can see those boots I was telling you about! 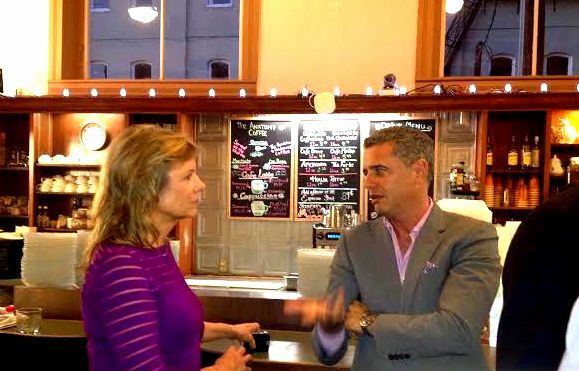 Following the Speaker’s Panel, we all hightailed it to Central Perk for a big plant based dinner – speakers, staff, and event organizers. That’s Mayor Ed Smith and Amanda Smith, front center. I was so sorry to have had to cancel my trip to this festival at the last minute. Which makes me very grateful for your pictures and report! You somehow make me feel as if I was there. Next year for sure. And that Reuben sandwich sounds delicious! Might just have to try it myself! So sorry you missed it too! I’m glad the report her is next best. And let me know when you try the Reuben. I’ve also made it with my home made Plant Burgers – it’s a good saurkraut and great bread that seal the deal. Thanks for stopping in, it means a lot to me! I’m impressed to see such a variety of speakers. It sounds like there were several interesting topics and activities. And congratulations on the race win, by the way! This looks like a lot of fun. There are more and more of these veg events each year, it seems. This one looks like a winner. Thanks for your report and I can’t wait for your book to come out! Hi Jim! You’re right, the variety was exemplary. Docs, athletes, advocates of all kinds. Edgy talks, passionate people. Educational and entertaining at the same time. I can’t wait on Journey either! Watch for updates right here!